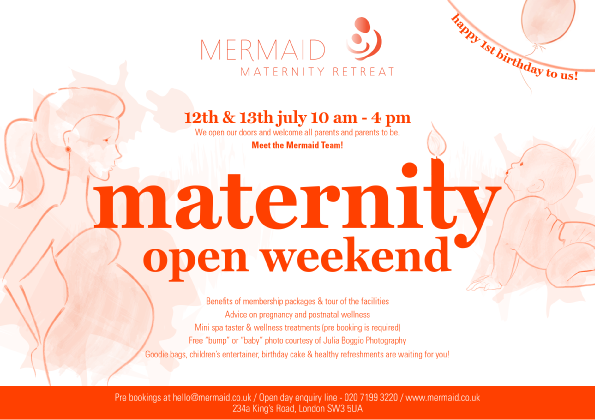 I’ll be at the Maternity Open Weekend this weekend – the 12th and 13th July at Mermaid on the King’s Road. They are celebrating their 1st birthday and as with all good parties they will be celebrating with cake, entertainment, goodie bags and a number of spa tasters and treatments. Mermaid are introducing some classes for older babies soon so even if your baby has already arrived come along and take a look -and I’d love to see you! I’ll be there on Saturday from 10am to 1pm if you’d like to come along for a chat/catch up. I’ll also be there on the Sunday from 1pm to 4pm.